When giant stars die, they don’t just fade away. Instead they collapse in on themselves, leaving behind a compressed stellar remnant, usually a city-size, superdense ball of neutrons appropriately called a neutron star. In extreme cases, however, most theorists believe an expiring giant star will form a black hole—a pointlike “singularity” with effectively infinite density and a gravitational field so powerful that not even light, the fastest thing in the universe, can escape once falling in. Now a new study is reinvigorating an alternate idea, reports Charles Q. Choi in Scientific American, that objects with names such as “black stars,” or “gravastars,” might exist midway between neutron stars and black holes. If real, these exotic stellar corpses should appear nearly identical to black holes save in one key way—they could not irretrievably swallow light. In the presence of gigantic amounts of energy of the sort produced by the collapse of a giant starprevious research found these virtual particles can polarize, or arrange themselves depending on their properties, much as magnets are divided into north and south poles. Carballo-Rubio calculated the polarization of these particles can produce a surprising effect inside the powerful gravitational fields of dying giant stars—a field that repels instead of attracts. 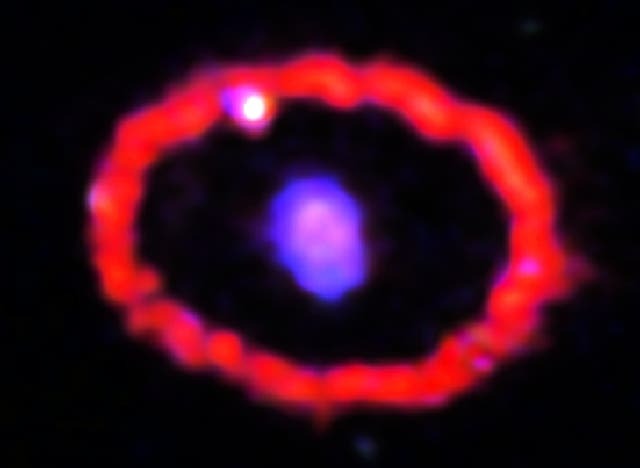 The image of Supernova 1987A at top of the page combines data from NASA's orbiting Chandra X-ray Observatory and the 8-meter Gemini South infrared telescope in Chile, which is funded primarily by the National Science Foundation. The X-ray light detected by Chandra is colored blue. The infrared light detected by Gemini South is shown as green and red, marking regions of slightly higher and lower-energy infrared, respectively. The core remains of the star that exploded in 1987, a possible black star, is not visible here. The ring is produced by hot gas (largely the X-ray light) and cold dust (largely the infrared light) from the exploded star interacting with the interstellar region.